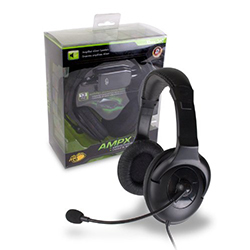 The AMPX Amplified Gaming Headset will take your Xbox360 gaming to the next level. Powered by your USB connection the AMPX outputs Amplified game and chat audio through 2 precision tuned 40mm drivers with Neodymium magnets. On Xbox360, you can tweak your chat volume and voice volume separately ensuring you are hearing exactly what you want to hear. A performance tuned flexible Boom Microphone will ensure you are heard loud and clear.